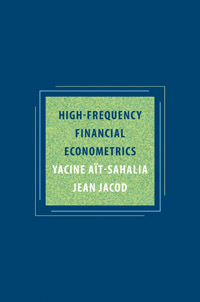 A graduate-level textbook about econometric and statistical methods to analyze high frequency data. Edited by Yacine Ait-Sahalia and Lars Peter Hansen, published in 2010. Maximum Likelihood Estimation of Stochastic Volatility Models, with Robert Kimmel, Journal of Financial Economics, 2007, 83, 413-452. Closed-Form Likelihood Expansions for Multivariate Diffusions, Annals of Statistics, 2008, 36, 906-937. Estimating Affine Multifactor Term Structure Models Using Closed-Form Likelihood Expansions, with Robert Kimmel, Journal of Financial Economics, 2010, 98, 113-144. Financial support from the NSF under grants SBR-9996023, SBR-0111140, SBR-0350772, DMS-0532370 and SES-0850533 is gratefully acknowledged. Documents on this page are in Adobe Acrobat format (.pdf). The Term Structure of Variance Swaps, Risk Premia and the Expectations Hypothesis, with Mustafa Karaman and Loriano Mancini, forthcoming in the Journal of Econometrics. Robust Consumption and Portfolio Policies When Asset Prices Can Jump, with Felix Matthys, forthcoming in the Journal of Economic Theory. Principal Component Analysis of High Frequency Data, with Dacheng Xiu, Journal of the American Statistical Association, 2019, 114, 287-303. A Hausman Test for the Presence of Noise in High Frequency Data, with Dacheng Xiu, forthcoming in the Journal of Econometrics. Semimartingale: Ito or Not?, with Jean Jacod, Stochastic Processes and their Applications, 2018, 128, 233-254. Estimation of the Continuous and Discontinuous Leverage Effects, with Jianqing Fan, Roger J.A. Laeven, Christina Dan Wang and Xiye Yang, Journal of the American Statistical Association, 2017, 112, 1744-1758. Using Principal Component Analysis to Estimate a High Dimensional Factor Model with High Frequency Data, with Dacheng Xiu, Journal of Econometrics, 2017, 201, 388-399. Increased Correlation Among Asset Classes: Are Volatility or Jumps to Blame, or Both?, with Dacheng Xiu, Journal of Econometrics, 2016, 194, 205-219. Bandwidth Selection and Asymptotic Properties of Local Nonparametric Estimators in Possibly Nonstationary Continuous-Time Models, with Joon Y. Park, Journal of Econometrics, 2016, 192, 119-138. Portfolio Choice in Markets with Contagion, with Tom Hurd, Journal of Financial Econometrics, 2016, 14, 1-28. Modeling Financial Contagion Using Mutually Exciting Jump Processes, with Julio Cacho-Diaz and Roger J.A. Laeven, Journal of Financial Economics, 2015, 117, 585-606. Market-Based Estimation of Stochastic Volatility Models, with Dante Amengual and Elena Manresa, Journal of Econometrics, 2015, 187, 418-435. Mutual Excitation in Eurozone Sovereign CDS, with Roger J.A. Laeven and Loriana Pelizzon, Journal of Econometrics, 2014, 183, 151-167. The Leverage Effect Puzzle: Disentangling Sources of Bias at High Frequency, with Jianqing Fan and Yingying Li, Journal of Financial Economics, 2013, 109, 224-249. Analyzing the Spectrum of Asset Returns: Jump and Volatility Components in High Frequency Data, with Jean Jacod, Journal of Economic Literature, 2012, 50, 1007-1050. Identifying the Successive Blumenthal-Getoor Indices of a Discretely Observed Process, with Jean Jacod, Annals of Statistics, 2012, 40, 1430-1464. Testing for Jumps in Noisy High Frequency Data, with Jean Jacod and Jia Li, Journal of Econometrics, 2012, 168, 207-222. How to Stop a Herd of Running Bears? Market Response to Policy Initiatives during the Global Financial Crisis, with Jochen Andritzky, Andreas Jobst, Sylwia Nowak and Natalia Tamirisa, Journal of International Economics, 2012, 87, 162-177. Stationarity-Based Specification Tests for Diffusions When the Process is Nonstationary, with Joon Park, Journal of Econometrics, 2012, 169, 279-292. Testing Whether Jumps Have Finite or Infinite Activity, with Jean Jacod, Annals of Statistics, 2011, 39, 1689-1719. Ultra High Frequency Volatility Estimation with Dependent Microstructure Noise, with Per Mykland and Lan Zhang, Journal of Econometrics, 2011, 160, 160-175. Edgeworth Expansions for Realized Volatility and Related Estimators, with Lan Zhang and Per Mykland, Journal of Econometrics, 2011, 160, 190-203. High Frequency Covariance Estimates with Noisy and Asynchronous Financial Data, with Jianqing Fan and Dacheng Xiu, Journal of the American Statistical Association, 2010, 105, 1504–1517. Nonparametric Tests of the Markov Hypothesis in Continuous-Time Models, with Jianqing Fan and Jiancheng Jiang, Annals of Statistics, 2010, 38, 3129-3163. Is Brownian Motion Necessary to Model High Frequency Data?, with Jean Jacod, Annals of Statistics, 2010, 38, 3093-3128. Estimating Affine Multifactor Term Structure Models Using Closed-Form Likelihood Expansions, with Robert Kimmel, Journal of Financial Economics, 2010, 98, 113–144. Estimating and Testing Continuous-Time Models in Finance: The Role of Transition Densities, Annual Review of Financial Economics, 2009, 1, 341-359. Nonparametric Transition-Based Tests for Jump-Diffusions, with Jianqing Fan and Heng Peng, Journal of the American Statistical Association, 2009, 104, 1102-1116. Estimating the Degree of Activity of Jumps in High Frequency Data, with Jean Jacod, Annals of Statistics, 2009, 37, 2202-2244. Portfolio Choice with Jumps: A Closed Form Solution, with Julio Cacho-Diaz and Tom Hurd, Annals of Applied Probability, 2009, 19, 556–584. Operator Methods for Continuous-Time Markov Processes, with Lars P. Hansen and Jose A. Scheinkman, in Handbook of Financial Econometrics, edited by Y. Ait-Sahalia and L.P. Hansen, 2009, North Holland. Estimating Volatility in the Presence of Market Microstructure Noise: A Review of the Theory and Practical Considerations, with Per Mykland, in Handbook of Financial Time Series, edited by Thomas Mikosch et al., 2009, Springer-Verlag. High Frequency Market Microstructure Noise Estimates and Liquidity Measures, with Jialin Yu, Annals of Applied Statistics, 2009, 3, 422-457. Testing for Jumps in a Discretely Observed Process, with Jean Jacod, Annals of Statistics, 2009, 37, 184-222. Out of Sample Forecasts of Quadratic Variation, with Loriano Mancini, Journal of Econometrics, 2008, 147, 17-33. Fisher's Information for Discretely Sampled Levy Processes, with Jean Jacod, Econometrica, 2008, 76, 727-761. An Analysis of Hansen-Scheinkman Moment Estimators for Discretely and Randomly Sampled Diffusions, with Per Mykland, Journal of Econometrics, 2008, 144, 1-26. Volatility Estimators for Discretely Sampled Levy Processes, with Jean Jacod, Annals of Statistics, 2007, 35, 355-392. Estimating Continuous-Time Models Using Discretely Sampled Data, Econometric Society World Congress Invited Lecture, in Advances in Economics and Econometrics, Theory and Applications, Ninth World Congress, edited by Richard Blundell, Persson Torsten and Whitney K. Newey, Econometric Society Monographs, Cambridge University Press, 2007. Saddlepoint Approximations for Continuous-Time Markov Processes, with Jialin Yu, Journal of Econometrics, 2006, 134, 507-551. Likelihood Inference for Diffusions: A Survey, in Frontiers in Statistics: in Honor of Peter J. Bickel's 65th Birthday, edited by Jianqing Fan and Hira L. Koul, Imperial College Press, 2006. A Tale of Two Time Scales: Determining Integrated Volatility with Noisy High-Frequency Data, with Lan Zhang and Per Mykland, Journal of the American Statistical Association, 2005, 100, 1394-1411. How Often to Sample a Continuous-Time Process in the Presence of Market Microstructure Noise, with Per Mykland and Lan Zhang, Review of Financial Studies, 2005, 18, 351-416. Estimating Diffusions with Discretely and Possibly Randomly Spaced Data: A General Theory, with Per Mykland, Annals of Statistics, 2004, 32, 2186-2222. Luxury Goods and the Equity Premium, with Jonathan Parker and Motohiro Yogo, Journal of Finance, 2004, 59, 2959-3004. Disentangling Diffusion from Jumps, Journal of Financial Economics, 2004, 74, 487-528. 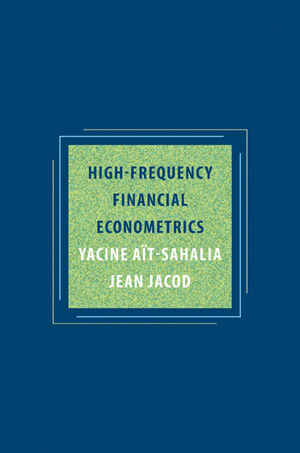 From Tick Data to Semimartingales, with Jean Jacod. Implied Stochastic Volatility Models, with Chenxu Li and Chen Xu Li. High Frequency Market Making: Optimal Quoting, with Mehmet Saglam. High Frequency Market Making: Implications for Liquidity, with Mehmet Saglam. Consumption and Portfolio Choice with Option-Implied State Prices, with Michael Brandt.